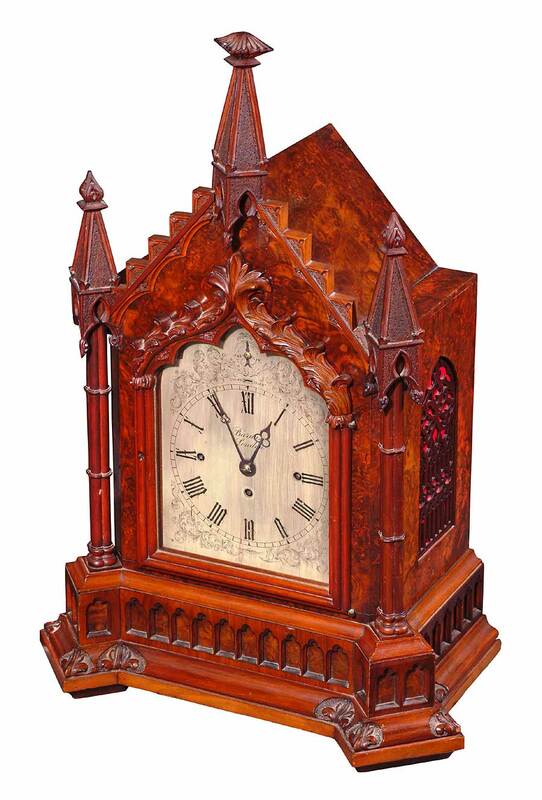 Clock, Bracket, Chiming, Gothic, 19th C.
To a late 19th C. Gothic revival bracket or table clock of high quality. The movement signed by the maker "BARWISE, LONDON" The clock strikes the quarters on eight bells and the hours on a gong. The eight day movement has the original recoil anchor escapement as well as a hold down piece to fix the pendulum for transport. The case is of rich burl walnut and the silvered dial has strike / silent lever and a separate dial for regulating pendulum speed.